A one-box solution to control 13 EOS stills cameras providing 13 power supplies, 13 opto-isolated focus/shutter triggers, and a 13 way USB3 hub. It has turned 15 boxes and 54 cables into 1 box and 14 cables. We have made approx 180 of these boxes, totalling control of over 2,300 cameras. We have recently added mautomatic multiple exposure processors to allow various different types of "chase firing" with no added cables. Unique identities for different placement of cameras & flashes has been used. We can now dial a variety of sequences. A 5-sequence shoot is completed in approx 700mS (>169 photos involving 5Ds, 6D, 100D, 750D & 600D cameras - all used in each of the 5 shots). We believe a competitor manages this in around 7 seconds, so we manage this in 1/10th of the time. It now allows any of a number of control sequences to be simply dialled in on a knob, and the entire set of cameras then follow the set sequence. It has now been updated to control Sony Alpha cameras in a geodesic dome (also designed by us) to complete 28 shots per camera x 30 cameras (with specific flashes per sequence) in approx 3 seconds, returnng around 50GB of data. We have produced some 600 of these boxes. Remote Head Control System - complete head/desk control with 3 x RS482/232 isolated comms channels each end, and CAN control of motor drives, Canon/Fujinon lens control. CONTROL DESK: Main control PCB, and smaller header PCB with haptic vibration motor, USB, 3 x isolated RS485 auto-switching polarity comms channels. HEAD: head control PCB, PSU board under the rear, and drive unit for pan motor. 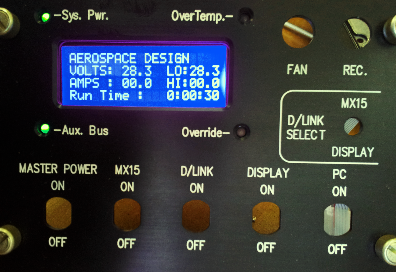 Helicopter Power Monitor - provides readouts of system voltage, current use, and running time (middle left & right pictures). It also displays the minimum voltage level reached, and the maximum current draw reached since switch-on (for further information, please contact Aerospace Design Facilities). Helicopter Generator Failure Power Control - We have recently undertaken the redesign of a power switching unit (for Aerospace Design Facilities / AS Aero) which will switch off non-critical power systems in the event of a generator failure.